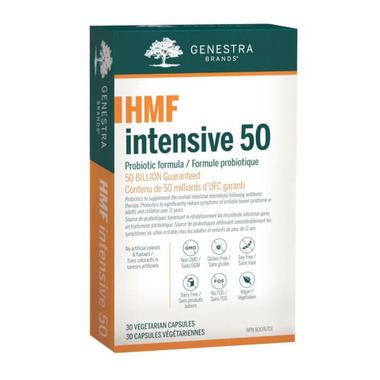 HMF Intensive 50 is a shelf-stable probiotic formula that offers 50 billion CFU from a combination of four proprietary strains. These microorganisms have been used in a wide body of clinical research and are one of the most studied probiotic combinations worldwide. Research has demonstrated that these strains support a healthy gut flora and promote gastrointestinal comfort. In addition, these human-sourced strains were selected based on their high quality and viability, strong epithelial adherence, and naturally high tolerance to stomach and bile acid. To further enhance probiotic survivability through the stomach, HMF Intensive 50 is produced with delayed release capsules. Each capsule is formulated with unique polymer properties that resist stomach acid and delay the release of probiotics after swallowing, allowing for complete, targeted release in the intestines and optimal probiotic activity.